Recently the Lord made a change in my plans. With every intention of heading up our trips to the Philippines, India, and Thailand, I began making final preparations to leave — including a routine checkup. Although I had a quintuple bypass six years ago, I had no recent indications of further heart problems. But the results of the checkup revealed I had blockages in my arteries which needed immediate attention. I would not be traveling halfway across the world any time soon. Since I was scheduled to lead two back-to-back mission trips, I called my son, Pastor Jim, and asked him to take my place. He received only a few days’ notice before he had to board a plane for the Philippines. Not only would he be traveling in my place, but he would also be heading up the Israel Trip. Shortly after I told my son the news, I went into surgery. One stent was inserted to help blood flow and prevent future blockages. Everything went smoothly, praise the Lord. The stent is working well and the doctors concluded my pulse is very good. We may not always understand God’s timing, but we must continue to serve Him and share the gospel. Here at VIG, we are especially thankful for the opportunities to share the gospel through our phone ministry. Below is a graph showing how many people have called VIG and trusted Christ. We are also thankful for your donations, which make this ministry possible. Although they have gone down within the last year, by God’s grace, one thing has gone up — souls saved. 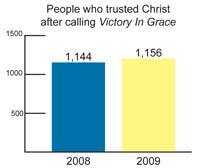 In 2008, 1,144 people trusted Christ after calling VIG, and in 2009, the number increased to 1,156. These numbers do not include the countless souls who have trusted Christ through VIG and have never called in.